Crispy Cast Iron Chicken | FINEX Cast Iron Cookware Co.
We were fortunate to have Executive Chef Mike Garaghty from Wüsthof Knives craft us this delicious chicken dish using our cast iron cookware. There’s nothing more flavorful than chicken that’s perfectly crisped in a cast iron skillet. Full of color, flavor and healthy nutrients—this is one recipe you’ll want to prepare year-round. Preheat your oven to 400 degrees. Generously season chicken with salt and pepper, then lightly season the skin with your favorite paprika. 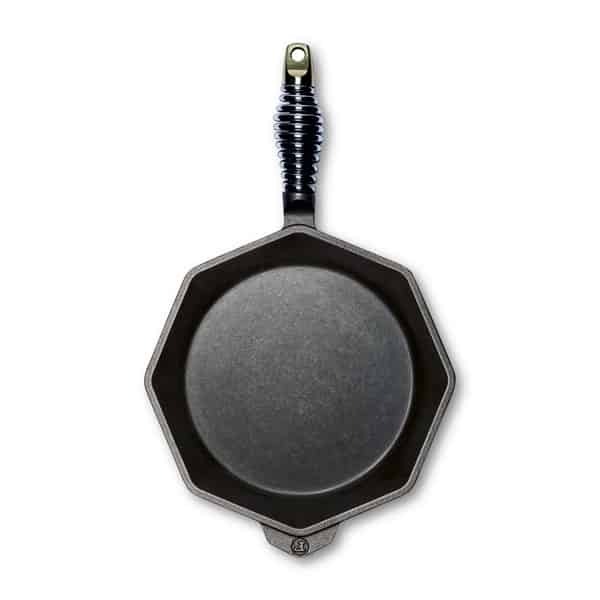 Preheat your FINEX 12-inch Cast Iron Skillet to medium to medium-high heat. About 5-10 minutes. Place chicken in the skillet skin side down and cook until skin is golden brown and crisp. Turn chicken over and place in oven until internal temp reaches 165 degrees for thighs and 155 degrees for breasts. Roast in the oven for 15-20 minutes. Once internal temperature is achieved, remove from oven and remove chicken from skillet. Drain about half of the drippings from the pan, save the rest for sautéing garlic spinach. While your skillet is warm with the drippings from the chicken—combine the onion, peppers, garlic and mushrooms. Sauté on medium to medium-high heat until the onions are translucent. About 3-5 minutes. Then add spinach, tomatoes, and wine. Cook down for 3-5 minutes more. Once garlic spinach is cooked down, remove from heat. Using tongs, place the chicken nested over the garlic spinach. Serve directly from the cast iron skillet.